The capitalization method of valuation determines the present value of all future income and benefits expected from an investment property from period 0 (today) to perpetuity. However, for many valuations it is necessary to determine the value of an income stream for a period less than perpetuity and compound formulae are used for such valuations. the present and future value of an income stream for a period less than perpetuity: PVPMT, FVPMT. the present or future value of a lump sum: FV, PV. With the above 5 keys almost all financial valuation problems requiring compound functions can be solved. A typical financial calculator is the Sharp EL 735. The following keystrokes are for the Sharp EL 735 calculator however, most financial calculators have similar keystrokes. The calculator must be in FINANCIAL MODE. The EL735 has a STATISTICAL and a FINANCIAL MODE. 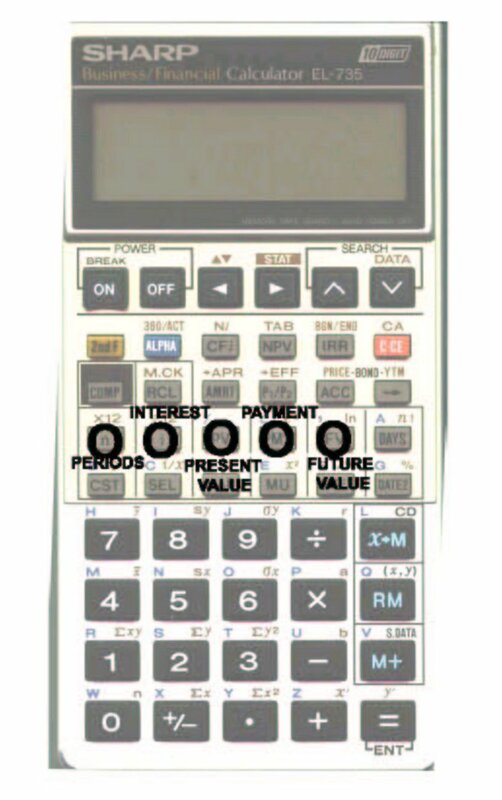 The secondary function key = 2nd F.
The calculator can be toggled between the statistical (STAT) and financial modes. The calculator assumes that any present value is a cost (eg the initial purchase price) and therefore shows the final answer as a negative. In this case, the negative sign is ignored. The amount or future value that 100 will amount to over 5 years if invested at 12% per annum is 176.23. From the above time scale it can be seen that the present value (PV) of $176.23 in 5 years time is $100. That is, an investor will pay $100 today for the right to receive $176.23 in 5 years time if he/she considers that 12% pa is sufficient return on that investment. Therefore, the investor will pay $1 for the right to receive $1.7623 in 5 years. How much will he/she pay to receive $1 in 5 years time at 12% pa? Therefore, the PV factor for $1 = 1/FV. The present value factor must always be less than $1 and the future value factor more than $1. The calculation of future or present value of 1 is called a factor because it is the basic value using $1 and the multiplier for finding the value of various amounts. The determination of a present value for a future amount is a common valuation problem. How accurate should the input data and final valuation be? If the final calculation is $680 880 the market value is; say $681 000. What is the present value of $8 000 due in 10 years time at 9% per annum? Therefore, the present value of $8 000 in 10 years time at 9% per annum = $3 379.29 say $3 380. Banks and financiers commonly quote interest rates as annual nominal rates. For example, 12% per annum nominal. Nominal in this context means "not exactly". Therefore, when the valuer analyzes the rate for comparison purposes it has to be adjusted to the real or effective interest rate. If interest is paid monthly, the effective rate =12/12 or 1 % per month. How is this amount converted to an annual equivalent? The effective interest rate is exactly that amount of interest that $100 will earn over one year. Therefore, to convert a nominal rate to an effective rate the valuer need only calculate how much $100 will amount to over 12 months and then deduct the principal of $100. Determine the effective annual rate for 12% per annum payable monthly. The amount must be more than 12% because the monthly interest amounts will attract compound interest over the 12 month period. Therefore, the annual effective rate is 12.68% per annum. The effective annual rate of 12.68%pa can be used directly in a valuation by capitalizing at the effective rate, annual income but payable monthly. Clear ALL with <2nd F><CA> or input 0 in those financial keys you are not using.